If there is one aspect of tourism in which Britain leads the world, it must be its gardens. The British have long been famed for their fascination with gardens: from the Tudors creating their great gardens like Hampton Court with its world famous maze; via the great botanists like Banks venturing around the world to collect seeds and specimens and bring them to botanical gardens like Kew, deservedly a world heritage site; to the cottage gardeners in villages around the country, places like Whittington near Oswestry, many of which open under the National Gardens scheme. What created this national obsession is not clear. Perhaps it’s recompense for and harnessing of our sometimes unpleasant weather – other places have a climate, we have weather. Perhaps it stems from our broken connection with the land, a desire to be closer to nature getting stronger the further we get from it. It matters little; we have magnificent gardens all over the land and can be proud of the fact. In spite of the misjudged foreign view of our weather as continually raining, Britain has some marvelous gardens that are almost tropical in nature. 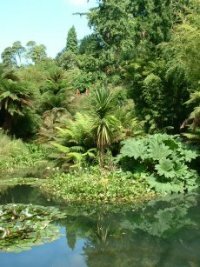 The famous Lost Gardens of Heligan in Cornwall has many visitors thinking of New Zealand with its tree ferns and lushness, but you don’t need to be in the extreme south of Britain to get such pleasures. Situated in the northern part of Scotland, Inverewe Gardens in Ross-shire have the benefit of the warming Gulf Stream lapping onto the western coast, enabling generations of skilled gardeners to create welcoming conditions for South African, South American, and Antipodean plants. Driving to the gardens through the rugged countryside first time visitors will find it hard to believe what they find at Inverewe. What nature in the form of the Gulf Stream does for Inverewe, human ingenuity has managed at the Eden Project in Cornwall, surely the greatest legacy of the millennium investments. The vast geodesic domes covering the site, once a clay mine for English China Clays, make this the world’s largest greenhouse, a fantastic day out even in the roughest weather that the Cornish peninsula has to offer. England was not alone in gaining a great garden from the millennium frenzy to make a mark for the future: in the Towy valley in Wales the National Botanical Gardens of Wales rivals the Cornish site, its own greenhouse being the largest single span glasshouse in the world. Further south still is a hidden jewel of British gardening, in the Scilly Isles. Tresco is surely not the easiest place to get to, but the Abbey Gardens there, covering a 17 acre site, are a wonderful reminder of how family stewardship over the years can bring a meaning and a coherence to a great garden. Of course the story of great gardens is also often the story of great gardeners, and Britain has had some of the most innovative and brilliant gardeners yet seen. But we were not isolated from the rest of the gardening world. Take the magnificent topiary gardens at Levens Hall in Southern Cumbria, for which we are indebted to the French – Guillaume Beaumont learned his craft at Versailles before beginning his creation of these gardens in 1694. The first great British name in gardening that would spring to most minds is Lancelot Capability Brown, whose creations are almost a who’s who of gardens for British stately homes: Chatsworth House in Derbyshire; Harewood House near Leeds; Longleat in Wiltshire; and perhaps his chef d'oeuvre, Stowe in Buckinghamshire, where garden architecture and layout are combined to what for the Georgian era would have been near perfection. Capability Brown’s successor, Humphrey Repton, left behind an equally glittering list of successful commissions: Sheringham Hall in North Norfolk; Brighton Pavilion; Woburn Abbey; and Tatton Park near Manchester. Brown and Repton embody the idea of conquering nature, in keeping with the age when nature’s laws and secrets were beginning to be understood, and equally in keeping with the strength of Britain in the world in the eighteenth and early nineteenth centuries. By the end of the Victorian period and moving into the Edwardian views were changing, and Gertrude Jekyll’s attempts to match the beauty of the natural landscape are a world and an age apart from the Georgians’. Her achievements at her own Munstead Wood home near Godalming in Surrey epitomise the grace of her style, which flows with nature rather than cutting into it, and of course her partnership with architect Edwin Lutyens. In the twentieth century another great female gardener, Vita Sackville-West, left her mark on the world of British gardens, as with Jekyll putting her ideas on colour, the changes that come with the different seasons, and unfussy design to greatest effect in her own home, Sackville-West’s being at Sissinghurst near Cranbrook in Kent.